Some interesting facts about our largely misunderstood neighbor. Mexico was the first foreign country I ever visited and I’ve been fortunate to return many times in the 15 or so years since my first trip to Reynosa to build a small home. Growing up, and continuing today, I often heard negative comments about Mexico and a condescending or hostile tone toward the country and its citizens. I love Mexico and wish that Americans knew more about and explored more of this wonderful country. Below are a number of figures about Mexico that you might not know, and will hopefully present the country in a different perspective that you have considered previously. 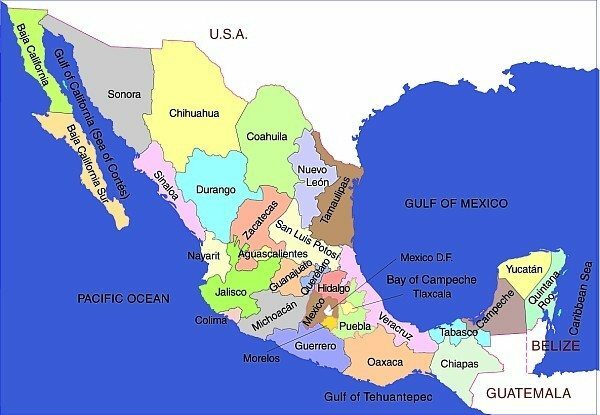 The total coastline of Mexico is about 5,800 miles, 13th longest in the world. Although Cancun and Puerta Vallarta may be the most familiar coastal cities to those in the U.S. there are many others like Zihuatanejo and Todos los Santos that are equally beautiful. Mexico is the 11th most populous nation in the world, with nearly 115 million people. Again, this is larger than any nation in Europe and puts Mexico just behind Japan in total number of residents. Mexico has the world’s 12th largest economy, with GDP of 1.86 trillion dollars in 2011. GDP per head is lower than in many countries, with a ranking of 85th, $14,800 per person in 2011. Hopefully this will change in the future as reforms are instituted and the economy grows. Mexico, as with many Latin American countries, has a serious issue with wealth disparity that needs to be addressed. For unemployment, Mexico had an enviable rate of 5.2% in 2011, nearly half the rate of the United States at 9% and far better than European countries in crisis like Greece (17.3%) and Spain (21.7%). Mexico has many natural resources and today is the 7th largest producer of oil and 16th largest producer of natural gas worldwide. Other natural resources, like the silver of Taxco, have played prominently in the history of Mexico. The richest man in Mexico is also the richest man in the world, according to Forbes magazine. Telecommunications magnate Carlos Slim is worth an estimated 69 billion dollars. Coincidentally, or causally, Mexico is a well connected country with the 12th highest number of mobile phones as well as the 12th highest number of internet users. Given the size of Mexico geographically, economically, and demographically I believe that it warrants a more prominent position in the eyes of Americans and doesn’t deserve the ‘little brother’ mentality that is often directed towards it. Outside of statistics, Mexico has an amazingly vibrant and diverse culture, cuisine, and history that are worth exploring. Here’s to better understanding and stronger connections between our countries in the future, and to many more adventures in Baja, D.F., and further afield. ¡Salud! « The Starting Line –GOP Voter Registration Fraud Program Continues to Unfold; Is There a San Diego Connection? Excellent article, there are so many places to visit in Mexico for a great vacation. Tony, thanks for the kind words. Such a beautiful country and so easy to visit from San Diego. Hopefully sharing some information on the positive side will help to encourage those who haven’t been to head south for a visit. Mexicans are some of the most loving and generous people, even if they almost nothing, they will share what they have. Lisa, I completely agree. Some of my most memorable meals in Mexico are from after a long day of work and sitting on the dirt with a family for a delicious homemade feast. Touching generosity and a reminder to those of us with more resources to share with our neighbors (and strangers). Thank you, Juan Anderson for writing this informative piece on our neighbor to the South! Since you built a house down there, John, I wish you would tell us about that experience, about the community, the neighbors, what was good and what wasn’t. We would love to know more. Since we are always talking about the wonderful Los Angeles Times, today there was a Page One column about the ecological threat to the near-mythic salamander that lives at the bottom of the floating gardens of Xochimilco in the middle of Mexico City. A country of amazing contrasts, great beauty and wonderful people! Frances, thanks for the suggestion. I’ve been thinking all afternoon about my first trips to Mexico and building houses there – will definitely write a follow-up article on the experience. That Times article was great – I love reading about things I’m unfamiliar with and the ajolote definitely fell into that category. Amazing (and sad) story that is played out in far too many places all over the world. Here’s to hoping they can make a resurgence. There are many things to say about Mexico and it’s culture, that goes well before the Spaniards arrived. And some of it actually extended far north to even the ancient, prehistpanic US. This is a history that we mostly do not know, but in Mexico that part is cherished and celebrated. Nadin – that is an excellent point. My vague guess on Cahokia was that it had something to do with mounds and was in Ohio so I guess I was close. Going to have to read up some more and hopefully visit next time I’m in the area. In our rush for progress we’ve definitely paved over, and ran over, many people, places, and things that didn’t deserve such treatment or to fade into memory’s oblivion. Thanks for pointing out one such place.